Uppersia Iran Travel blog: The magical sound of Dotar. The ancient land of Khurasan (also spelled Khorasan) covering eastern Iran is home to a big share of Iranian literature, art and culture. Many of great Iranian poets like Ferdowsi, Khayam and Mehdi Akhavan Sales, who is a legendary contemporary poet in Iran, have been grown in the sunny land of Khurasan. Besides literature and poetry, Khurasan is the provenance of fabulous folkloric music. Listening to lullabies and traditional pieces of music in Khurasan is one of those unique experiences that any traveler should be lucky to have while traveling in Iran. 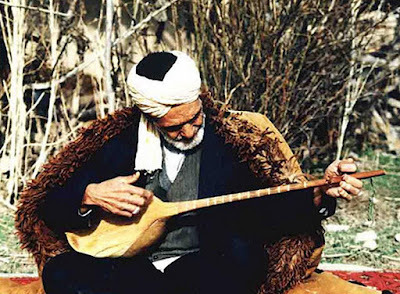 Having traveled through the time since thousands of years ago, Dotar (Dutar) is the most fabulous instrument of Khurasani music which is played by the local music masters like Haj Ghorban Suleimani in different cities of Khurasan province including Torbat e Jaam, Neishabour, Ghouchan, Shirvan and etc. The deep and magical sound of Dotar and folkloric songs including old mythical stories sang by vocal masters with their strong and emotional voice, offers the unforgettable sound of Khurasani music which is the oral conveyor of Iranian culture.